Did you know that Minneapolis has an 11-lane street? Did you know that some of our most picturesque places, some amazing architecture, and one of the most heavily traveled bike routes in the city sit cheek-to-jowl with what is effectively an at-grade freeway? It’s true. It’s called Hennepin Avenue, it’s called Lyndale Avenue, it’s called Highway 55, it’s called the Loring Greenway, and it’s the Bottleneck. The Bottleneck is historic, it existed long before the freeway systems and the automobile, and according to Alex Baumann, used to be a swankier place. 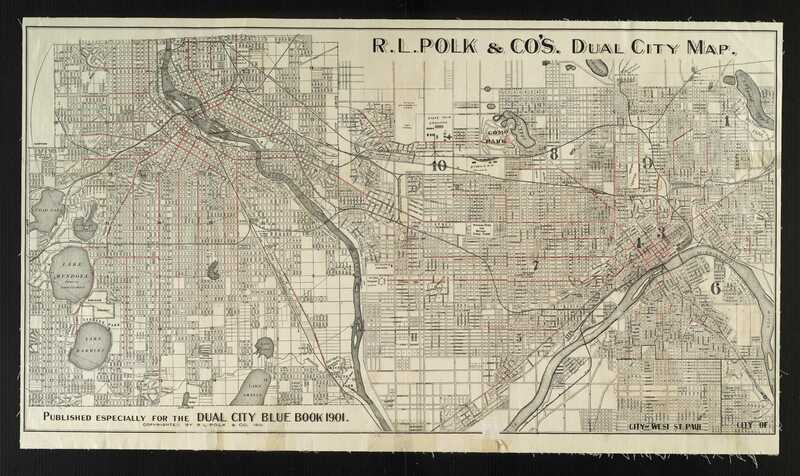 I imagine prior to the automobile, the intersection of two major streets like Hennepin and Lyndale was a place of lively commerce, a place where commercial enterprises wanted to be and housing was in high demand. Since then, it’s become a combination local street, county road, state highway and freeway on-ramp. Combined, the north and south segments in the Bottleneck serve about 50,000 cars per day. Over at Strong Towns, Chuck might call it a “stroad“, but I’d say it’s more accurately described as a streeway, given it’s massive size, speed and access to the interstate. I think few would argue this stretch of street/highway serves local land uses well, it’s much more oriented towards moving lots of cars to other places, fast. And that’s the issue. I argue that first and foremost, this street should serve local travel (by car, bike and bus) and local land uses, with emphasis on regional travel being secondary. Downtown was cut off from the rest of the city by a freeway, a decision we won’t likely be reversing soon. But as one of the few remaining connections across that barrier, how can we make this public space serve the city and residents and create a safe, livable space? I want to throw out a few possible ideas, not as perfect solutions but as conversation-starters. Some of these ideas are fantastical, many are very expensive. I’ll admit, this isn’t an exercise in what is possible in the next 5 years, it’s an exploration of what the best solution for a livable city might be long-term. Access to the freeway, especially 94 eastbound is especially concentrated in the Bottleneck. Southbound Lyndale/Hennepin can enter 94 east, and BOTH Hennepin and Lyndale south of the freeway have eastbound access. The next place to get on 94 headed east is on the other side of downtown, at S 6th Street, which is 2 miles away (or you can enter 35W at Franklin, ~1 mile away). Could more east- and westbound access be added at Nicollet, 1st or 3rd avenues? Off-ramp access from 94 westbound could also be added at 1st and/or Nicollet. Additional access at these places may ease congestion in the Bottleneck and provide some opportunity to reduce the number of lanes. I-94 is already in a tunnel under the Bottleneck. Let’s also do the following: tunnelize the on-ramp to 94 eastbound from Hennepin Avenue headed north. Remove the eastbound on-ramp at Lyndale headed north. Remove the flyover on-ramp that allows access to 94 eastbound from Lyndale/Hennepin coming from the north and instead provide a tunnel access at Dunwoody Boulevard. Don’t make drivers from southwest Minneapolis drive all the way through the Bottleneck past 394 to get on 94 westbound, engineer a westbound tunnel access at Hennepin/Franklin. While we’re at it, why not bury 94 all the way to Plymouth Avenue (or further?) and return Lyndale to it’s former glory. With these on-ramps and additional lanes tunnelized, a lot of space is freed up for local traffic, boulevards, medians and bike paths that aren’t in conflict with pedestrians. A lot of drivers are using the Bottleneck to access 94 east, either from the north or south. If you removed these access points, what would happen? Drivers would disperse to other access points, like Franklin, 6th Street or Cedar Lake Parkway. This might not be the best strategy since it would just push congestion to other freeway access points, but it would mean you could recreate Hennepin/Lyndale as more local access streets. This strategy could be paired with some of the access additions specified in #1. How about instead of a crazy mess of overpasses and double Lyndale Avenues, we just create a giant roundabout on top of the Lowry Tunnel? While traffic won’t be reduced, flow might become more even, throughput may increase and traffic may even be slowed. Downsides – taking land may be necessary and it probably means no reduction in the number of lanes would be possible north of the roundabout. I have not a clue how large or how many lanes across such a roundabout might need to be. Some transportation engineers will surely weigh in. The bottleneck is the bottleneck because the grid is broken to the east and west of these streets. North-south access is cut off. It’s theoretically possible that some of the bottleneck-iness of the area could be relieved by connecting the grid. To the east, connect Spruce Place to Pillsbury and Willow Street to Pleasant over 94. To the west, connect Colfax to Bryant Avenue South, Dupont to Dunwoody Boulevard and Emerson to Northrop Lane. These solutions would likely be highly unpopular with residents. 6. Make Hennepin less convenient as a regional link, better for local users. Part of the congestion in the bottle neck is caused by commuters who use Hennepin Avenue to get to Saint Louis Park and points west, instead of using 394/Highway 100. While Metro Transit won’t be studying Hennepin for Rapid Bus because it’s too complicated (even if it has superior performance measures), this isn’t a limiting factor in my imagination. Let’s put a dedicated Rapid Bus Lane down each side of Hennepin (or a peak lane that switches sides), taking the space from a travel lane. This will give space to transit, upgrade one of the poorest-performing (but busiest) lines in the system and simultaneously discourage regional traffic from using a local connection when a regional one is available. These are my thoughts, based on my many trips through the Bottleneck by car, bike and bus. I’m sure there are other potential solutions. There may even be some folks who think we don’t need to do anything to the area. I would argue that we do, and now is as good a time as any to start dreaming. If you’ve got thoughts, you know where to leave them. This is a jaw-droppingly good post. Thank you for keeping the heat on the Bottleneck, which is probably the single most tragic space in Minneapolis. All your suggestions are worth considering, and frankly the roundabout is a no-brainer once the overpasses need replacing (which will be soon, since they're close to the end of their useful life), but unfortunately it's hard to imagine a future, rapid bus or same old slow bus, in which the Bottleneck is not going to need a lot of capacity. So my suggestion is a fairly simple one: plant trees in the median. Some tall, leafy, mature trees would go a long way towards making the place less vast and more comfy. If they neglected to leave enough space between the tunnel and the surface, add a raised bed in the median. If the siting of trees would block some of the signage, move the signage. In the long term, I favor a radical rebuild, costing as much as it takes to create a usable, beautiful space for this extremely prominent site. But in the short term, just plant some trees. Re #1: Why consolidate the ramps at Hennepin? Then the ramps would have to cross Lyndale somehow – either in a tunnel or as a bridge. Wouldn't it be easier and simpler to consolidate the ramps at Lyndale, which would essentially just leave the existing ramps to/from lyndale in place and eliminate the ramps to/from hennepin? I'd like to see an option that eliminated the portion of Lindale Avenue east of I-94 north of Oak Grove St. I'd like to see the portion of Lyndale west of I-94 in this location be used for two-way traffic. This would eliminate Lyndale as a continuous north/south route into North MPLS, but Lyndale's viability as a continuous north/south route was compromised decades ago. Another option to reduce traffic volumes through here could simply be to improve freeway operations (perhaps by expanding freeway capacity through the tunnel). I usually bike to work, but when I drive home to South Minneapolis from Golden Valley, I drive through this area. If there was no congestion, I would just stay on I-394, to I-94, to I-35W. But since traffic on the I-394 to I-94 ramp is always terrible, I always exit 394 at Dunwoody, turn south on Lyndale/Hennepin, and get right back on I-94 eastbound at Lyndale. This is probably "bad" motorist behavior, but it's sure quicker than being stuck in traffic on the freeway. The problem is that, given the freeway and the existence of the street grid, Hennepin violates the grid from Lyndale to 27th. North of Lyndale (i.e. in downtown) Hennepin is roughly an East-West Street, south of 27th it is a North-South Street. New York had this problem with Broadway. Its solution was to close it to through traffic, i.e. to disconnect it in many places. Suppose you created a Hennepin Transit Mall, with room for bikes, pedestrians, and a high-quality fixed-route transit service connecting Uptown with Downtown (with a flyover/short tunnel somewhere). Hennepin Avenue from downtown would be routed onto Dunwoody (to I-394), and Hennepin at Lyndale (north) would be a diamond (or partial diamond) four-way interchange. The stretch of Hennepin from the Walker to 26th or 27th would be disconnected. There might be some blocks with 1 block long access points, but nothing would be through for cars. Transit would have pre-eminence. Lyndale would remain a through route for all vehicles. Access to I-94 EB via Lyndale, Access to I-394 WB via Dunwoody. Access to I-94 WB (i.e. NB) via Lyndale north of I-394. No access to Hennepin south of I-94 via I-94 WB, as it would be closed. The Hennepin to I-94 EB ramps would be closed. On Lyndale, left turns would be prohibited for a few blocks south of I-94, restricting access to the Wedge from the north, people could turn on Garfield to 22nd instead. I like this solution a lot, but it seems far outside the realm of the politically possible. This is one area where I think freeway improvements are warranted and would actually improve the local street realm. There's $790 million going to build a new bridge that would go a long ways here. The existing northbound Lyndale and Hennepin to EB 94 are very useful ramps and actually get people away from the funnel. It seems like the main movements through the funnel that are problematic are going north to access WB94 or 394, or EB (south) 394 or 94 to local streets. Better freeway access at the east end of the tunnel would help this but it would conflict with the other ramps in this area. Obviously there are major problems with the Lowry tunnel as well, since so much traffic connects between 35W and 394 in addition to 94. I've always thought a bored tunnel between 1st Ave and 15th and the turbine NW of the Basilica would be great to replace the mainline of 94, but I bet that would be spendy. Then the existing tunnel could be used as a long connection between 35W and 394 with connections to 94 at both ends. If money were no option, the best way to fix the congestion downtown (in my opinion) would be to tunnel I94 through downtown between Riverside and Broadway in a way similar to Seattle's Alaskan Way. Also, extend the Lowry tunnel north past Dunwoody and add SB ramps at Dunwoody. I could easily see this costing a billion dollars, and although I think there are better things the money could be spent on, perhaps it could be paid for by a fuel tax increase or through tolls. The I94 tunnel and re-route would remove a lot of congestion on I94/I35W, remove the pressure during morning and afternoon commutes through the tunnel, and with the extra capacity, the new ramps at Hennepin/Dunwoody would be possible and could greatly reduce the number of south bound vehicles who are trying to get to I94 EB. Only when vehicles can be removed can I see this space possibly becoming useful. It could be such a great pedestrian space if the traffic weren't there. I like your idea of the roundabouts. There appears to be enough room for a few turbo roundabouts in the area. If properly designed, I could see just doing that fixing a lot of the problem. One at 15th st, one at Groveland, and one large one at the confluence of Hennepin, Lyndale, and the I94 ramps at the south end of the tunnel. One other thing to consider: There are no good N/S routes across I394 between Lyndale and Hwy 100 due to the railroad tracks and lakes. Adding a few bridges, such as one between Penn Ave and Douglas Ave would help matters greatly. Are there any plans yet to redesign this area? Hennepin Ave takes a sharp right north of Franklin Ave to intersect Lyndale at the current location of the EB I-94 on ramp. The WB I-94 off-ramp bridges over I-94 to intersect at the same location. This would create a single intersection for all freeway traffic (this would probably end up being a very large intersection). Then the local street grid is reconnected. Existing Hennepin between Lincoln and Douglas is re-named "Old Hennepin". All at-grade. The only bridge here is the new westbound I-94 connection to Lyndale, which may replace or augment the existing off-ramp to Lyndale. The resulting space can be developed. The biggest problem with this proposal that critics will point out is that it concentrates all freeway traffic at a single intersection. Of course careful traffic modeling would need to be done. The biggest question, however is determining our priority. Do we prefer better urban design over traffic operations, or do we prefer operations over design. I like this plan a lot, though I am not sure about the flyover to Hennepin Avenue. The route between Lincoln and Douglas should be called Debate Avenue. Funniest thing I've seen in a good while. I like this solution, but it doesn't seem to do anything to address the amount of traffic going through the actual bottleneck (roughy Hennepin to Douglas Ave). Also, the right turn you have to make on Hennepin to Douglas Ave traveling northbound seems like nothing a traffic engineer would ever allow. Well, I guess I'm not certain that the bottleneck is the primary problem that needs to be solved here. I think downsizing these roads, regardless of how many vehicles drive here, is probably a good idea. Like I said, do we design the road to meet traffic projections, or do we regulate volumes through design? Also, I've seen renderings of the giant roundabout at this location before. It was several years ago. I thought it was an official study commissioned by the City, but I can't seem to locate it now. The Transportation Advisory Board recently awarded Minneapolis a chunk of change ($6.6 mil) to reconstruct this area in 2015 or 2016. So, there will be discussions coming! Although unless more $ comes from elsewhere (there's $1.7 mil in local match), most of these ideas will be far off the table. – Nitpick: Highway 55 does not and has never gone through the surface part of the Bottleneck. Only recently…about 5-6 years ago…did it get rerouted out of downtown, but it follows I-94, not Lyndale. The last time a state highway went through the bottleneck was in the very early 80s when Highway 169 followed Lyndale Ave (before being moved to Hwy 100 ca. 81-82). – Regarding the possibility of adding/removing access, it should be noted that more access was originally proposed, namely an eastbound off-ramp to 3rd Ave, but after a <a>1963 freeway study, it was determined that additional access would make things worse at the Bottleneck. Trying to add additional access as Brendon suggests would not help this problem, plus there would be the additional issues of ramp spacing along the I-94 mainline (especially at I-35W) and the possible need to bridge one set of ramps over/under another, which adds cost and right-of-way requirements. – Regarding burying more of I-94, this may be doable in segments between Lyndale and Hiawatha, but the fatal flaw in extending the tunnel all the way to Plymouth Ave is the tunnel that carrys Bassett Creek. The best you could do without impacting Bassett Creek is to extend the tunnel north to Olson Hwy, but you'd have to daylight I-94 by the time it crosses under Olson Hwy, and you'd have to keep the ramps to/from I-394 at their existing grade, especially the ramps between 394 and the existing tunnel. – Reuben's right in that a traffic circle (vice a true roundabout) was considered for the Hennepin/Lyndale/I-94 ramp area. It was an option in MnDOT's 2007 Downtown Minneapolis Freeway Study. You can find the tech memo documents here…they're in Appendix C+D. 3 of the 4 scenarios had a signalized traffic circle of varying radii (depending on the frontage road/I-94 access options selected), and 3-4 lanes wide. With some potential bridging over the I-94 tunnel portal, a traffic circle could be built within the existing right-of-way, although traffic would be a mess during construction. – Finally, the same study suggested that it's technically feasible to widen the tunnel to 10 lanes, though it would be a massive and expensive undertaking that would also be a traffic nightmare. To me the biggest problem with the bottleneck is that they rammed a freeway through the heart of it, adding heavy noise, air and visual pollution to what should be one of the premier public spaces of the city. Unfortunately the only solution to that is to cover it up, which is expensive. But it's also an opportunity to expand greenspace – including a North Shore-esque cliff – and to add a signature visual presence such as a statue or a giant Mpls sign (if this is too cheesy or showy, it is not crucial). It also is an opportunity for a much more comfortable pedestrian crossing, and potentially bike/ped overpass over Oak Grove – since the land bridge would be above grade, it should be relatively simple to build a viaduct that eventually meets the grade of the inclining Lowry Hill. For the south end I used the roundabout option, but I'm not certain that is the best solution for that end. It would be way better than the existing configuration though. BTW thanks very much Froggie for the links to the MnDot study – I made this map before I saw it but it's surprisingly similar. One difference I'll note is that separating the north legs would make for a wider median and would likely make the overall space feel less vast. Clustering those legs, though, would give you more plaza space, which is nice too. With two roundabouts I get rid all of that mumbo jumbo. First roundabout is at groveland terrace. This would allow us to realign Lyndale after the roundabout. And provide the entrance ramp a route still. For the Entrance ramp and southbound lane they would use the second roundabout. For the 231 B I would divert the traffic on dale pl to Groveland so that this traffic then get hit the roundabout. I LOVE this idea! This to me seems close to what the Bottleneck should have been even before we had a freeway there. One separated bidirectional road through the area. This is more of a traffic circle than a roundabout, though, right? 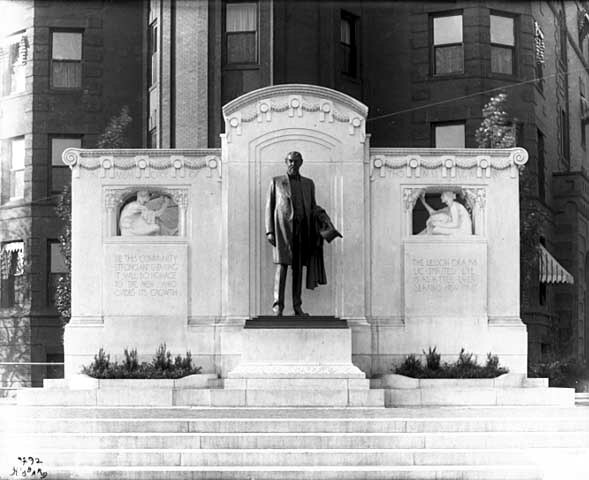 Incidentally, the Thomas Lowry memorial statue that now sits at 24th and Hennepin previously sat at Lyndale and Hennepin in what was known as Virginia Triangle, a unit of the Park Board. Why not move it back into the middle of this new traffic circle? This would be the perfect visual centerpiece to sit atop the Lowry tunnel and return the statue at least close to its original location. Opening the Van White bridge will be an improvement on this intersection, taking through traffic off Lyndale. A better connection between Dunwoody, Kenwood, and a route connecting with Hennepin (Fremont?) would also help. As would a flyover bridge connecting Penn Avenue with Kenwood Parkway at Douglas Avenue. Concentrate on making more holes in the wall, rather then try to make the current hole bigger.